Barrier games have two or more players in which there is a "barrier" so they cannot see the materials each other have. Every player has the same set of materials. Taking turns players give very specific directions on how to arrange or manipulate the materials without any visual cues. The goal of the game is to have all players' materials look identical. Looking for a way to hear the voice of all your students in an efficient manner? This process uses a silent conversation on chart paper where students share ideas, questions or reflect. Chalk Talk is an excellent example of visible learning. To learn more about the strategy in detail check out Making Thinking Visible by Ritchhart, Church and Morrison. Write a prompt on a large chart paper for each group. Discuss the prompt with students and have them record their ideas. After students have had time to respond, have them switch to a new table. Here students read what is written and respond to it. The response can be a connection, or students can elaboration on what was written. After several rotations, students return to their original starting place to read the comments. Share their thinking after reading. What did they notice​ about the comments? Anything surprise them? Note: Students can rotate as a group or move freely. Circle of viewpoints is an effective strategy that can be used when you want your students to view an image, story, issue or topic from different perspectives. 1. Introduce the image, story, issue or topic and allow students time to examine or think about it. This also allows time for questions or clarification. Place this on chart paper or board. 2. Identify any possible viewpoints. List these viewpoints around the image, story, issue or topic. 3. Viewpoint selection. Allow students to choose a viewpoint they want to explore. If students are in groups, encourage them to each to explore a different viewpoint. 4. Respond. Students now respond to "I think" from their perspective. Students will need time to collect their thoughts before they respond either in notes, formal writing or mentally. 5. Group response. (optional) Students may put themselves in the place of this perspective and come up with a question or something they are curious about. 6. Share their thinking. You can decide if students will share in small groups or as a whole group. If you want to get many different perspectives you may want to do a whole class discussion and look for common threads. If you want a more in-depth explanation of this strategy see Making Thinking Visible by Ritchart, Church, and Morrison. Available via district libraries. Claim-Support-Question is a thinking strategy that has students examine a claim to look for patterns, generalizations, and opposition. CSQ also helps students think about how they support the claim, but also how they question it. 1.Claim: Present a claim. What's going on here? 2. Support:Ask students what they might already know about this claim? OR After you have studied a topic, how will you support this claim? 3.Question: Ask students to think beyond supporting the claim and share evidence for an opposing view. What's the evidence for the other side? 4. Share their thinking-Did your stance change or is it now questionable? In groups students write a dialogue pertaining to a topic. 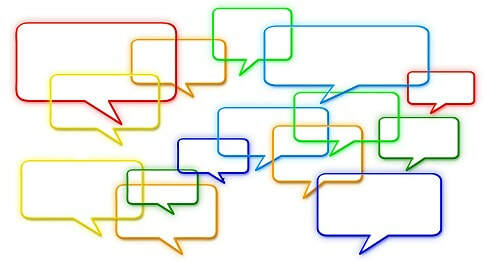 The focus of the dialogue should highlight and extend understanding of the main idea of the topic. Students should use assigned vocabulary. All students need to write their own copies. When completed with writing all students participate in the oral presentation. Include the directions within the first few slides. Be clear on the expectations, groups etc. All student work is in one spot. Students can look at each other's work as models or generate their own ideas. Completed work is seen in real time. Teacher can give immediate feedback via the comments. This transforms the project from a static standalone process to a dynamic interactive one. A great strategy to help build background knowledge or introduce a new unit. Click here for detailed directions. 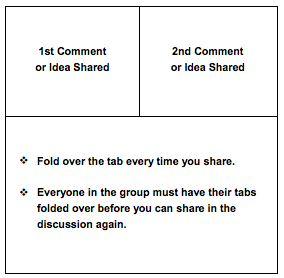 Conver-Stations is a small group discussion strategy that gets students up and moving around. This strategy leads to deeper understanding and encourages students to lead the conversation. Planning to have a discussion? Need a way to keep track of subtopics and student input? This is also a great strategy to use with a willing colleague to map while you facilitate discussion. Click here for information on how to integrate this strategy into all content areas. "Final Word " is similar to "Save the Last Word for Me", but with a little different twist. This strategy has students interact with the text as they read. It also challenges students to be active listeners and speakers. 1. The teacher develop reflection questions, writes them on slips of paper, and places them in a bowl, basket, bag, or other container. 1.The students pick a question from the container and reflects on the question independently. 2.The teacher develops class question sets for each small group. Each student chooses a question and,reflects on it. 3.The teacher develops enough questions for half of their class and makes two copies.The students select their question, then find the person in the class with the same question. They reflect on the question with their partner before reporting out. Four "A"s Text Protocol is an organizer for students to use as they read the text or watch a video. The organizer is then used as a guide in the discussion. The directions are easy to follow and can be modified easily to fit your specific needs. Want a real quick discussion strategy that requires no planning? Check out 4 Corners and see how it could work for you. A sequential organized discussion that encourages participation of all members. This strategy can be used with text or video. ​2. Group students and have them discuss similarities and differences between their notes. 3. Students then compile their notes into a single-paragraph group summary. This strategy requires students to think about what was important in their own notes and then discuss what needs to be included in their group paragraph. Icon Prompt is a scaffold thinking and discussion strategy. It can be used at the beginning of a unit, end of a unit or both to see how their thinking has changed. Icon Prompt Template Watch the video and learn more. Idea Cards work for small groups. Print the cards for each group. Students take turns selecting a card and responding. The response can be immediate and only verbal, or after each student takes a card, time is given to think, write and then discuss. After reading, groups have a reflective discussion. Jigsaw uses cooperative learning to build understanding. Judge-Jury is a cooperative learning strategy in which students argue a debatable issue mimicking a court room setting. This is a great game to help develop student speaking and listening skills. Prepare a set of questions for the group to share. Sample question: What is the single most important word in this chapter? Why? What is the central theme of this passage/chapter/book? Why did we read this book? What value hold for the modern reader? Hand each group a “mystery envelope” with the set of questions. Taking turns, each group member pulls a question from the envelope and reads it to the group. Each member in the group has an opportunity to answer the question from their perspective using evidence from the text to support their response. Each group will share their group responses with the entire class. This is a discussion strategy that is done in groups of four. With a few minor adaptations, it would work in most content areas. We all are familiar with pro/con, but adding the questions column gives students the opportunity to think more deeply. A detailed example with question starters is available on the website. This two-part method teaches students how to engage in conversation about assigned text. After reading a passage, students write an open-ended question at the top of a sheet of paper. Organize a group paper pass giving students 2- minutes to respond to each paper that is passed around. As papers go around the group, the responder sees not only the initial question but several other students’ responses, too. When the rotation is complete the students are given time to read the responses on their documents. End with a full group open discussion. Provide students with a problem or issue related to the course content. Snowball is a an discussion strategy which requires no preparation. Students begin with a partner and respond to a predetermined question. After the partners share their ideas, they now join another pair. As a group of four, they share their ideas with the new group. The group of four joins to make a group of eight and shares their ideas. This pattern continues until the whole class becomes one discussion group. See information below on how students can use texting in the classroom as a tool for formative assessment. In this activity, students are given slips of blank paper, roughly the size of bookmarks. As they read, they take note of their trouble spots in the text- places where comprehension begins to falter. When students arrive in class the next day, they are placed in groups and asked to share their trouble spots with their peers. Together, they try to work through the confusion. *This teaches students that confusion is normal; and, through discussions with peers, students are often able to deal with their confusion without the assistance of the teacher. Tug of War is a twist on the traditional game which gets students involved and promotes critical thinking. I can be used in any content area K-12. Identify the factors that "pull" at each side of the dilemma. These are the two sides of the tug of war. Ask students to think of "tugs", or reasons why they support a certain side of the dilemma. Ask them to try to think of reasons on the other side of the dilemma as well. Generate "what if?" questions to explore the topic further. It sounds simple, but students must read the text/video and be able to determine the gist of what they read/viewed. The discussion that follows will lead to deeper understanding.